Sears has been on a downward spiral almost since the day it merged with Kmart in 2005. And that plunge seems to be picking up speed. 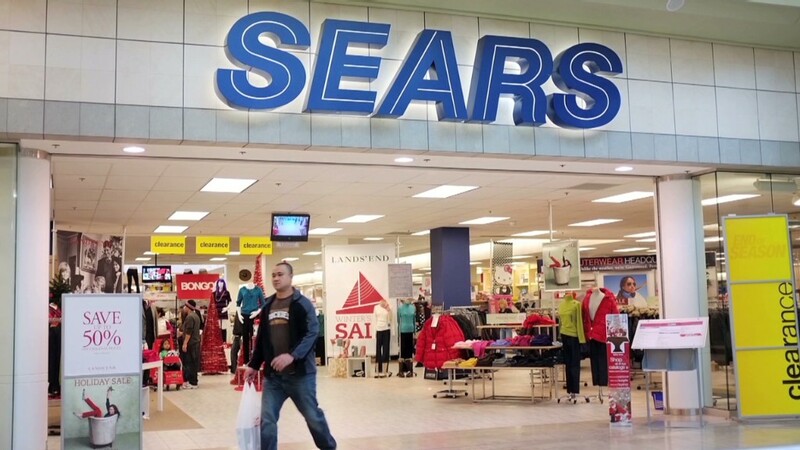 The company said this week that it may sell its 51% stake in Sears Canada, which operates nearly 20% of the company's stores worldwide. It has quietly closed nearly 100 U.S. stores in the last year. Next week, it's expected to announce dismal fiscal first quarter results and possibly yet more store closings. "They have too many stores and they're losing a lot of money, burning cash," said John Kernan, an analyst with Cowen. "The lights are going off at Sears and Kmart," he said. "There are tumbleweeds blowing through the parking lots at Kmart. They're basically completely irrelevant." The company won't comment on store closings, but CEO Edward Lampert reportedly told shareholders at this month's annual meeting that "closing stores are going to be part of our future. The world has shifted." A company spokesman did not dispute that quote. Sears was once the nation's largest retailer and biggest employer. The iconic company reshaped shopping in the United States with both its catalogs and its massive department stores. But the Kmart merger has been a disaster from the start. Sears Holdings (SHLD)' sales have declined every year since 2006, and it's been losing money since 2011. Today it's losing out to competitors from Home Depot (HD) and Wal-Mart Stores (WMT), to Target (TGT) and Amazon (AMZN). Brian Sozzi, CEO of Belus Capital Advisors, says he expects that there will be more Sears closings without any formal announcement. "If they come out and say they are closing hundreds of stores, their stock would plunge and the cost of borrowing would shoot up," said Sozzi. Selling the Canadian stores would raise much-needed cash. The company recently spun off its Lands' End unit that it paid $1.9 billion for in 2002. Two years ago it sold a line of specialty stores, Sears Hometown and Outlet Stores (SHOS). Analysts say Sears is suffering from a lack of investment in its stores; it's investing very little in its retail space compared to competitors. "It's evident that Lampert's been putting Sears Holdings through a slow, orderly liquidation," said Allan Ellinger, co-founder of MMG, a retail investment bank and restructuring advisor. "Every other retailer is investing in the business. This guy is doing nothing."